In this file image made from Nov. 3, 2018, video, an F-18 fighter jet prepares to take off from the USS Ronald Reagan during maneuvers in the waters off Iwakuni, Japan. 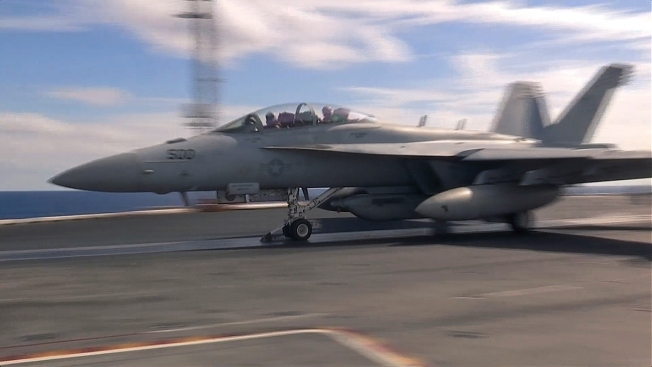 On Monday, while on routine operations in the Philippine Sea, another F-18 from the USS Reagan crashed into the sea but its two aviators were rescued safely. A U.S. combat jet from the aircraft carrier USS Ronald Reagan crashed into the sea northeast of the Philippines on Monday, but its two pilots were rescued safely. A rescue aircraft quickly plucked the pilots from the water and brought them back to the ship, the Navy said in a statement. They were in good condition and the aircraft carrier has since returned to normal operations, the Navy said. The crash was the second involving aircraft belonging to the USS Ronald Reagan in less than a month. The aircraft carrier participated in a joint exercise known as "Keen Sword" with Japan and Canada from Oct. 29 to Nov. 8 in waters around Japan and near Guam in the Pacific. The F/A-18 was part of Carrier Air Wing 5 onboard the Ronald Reagan, the Navy said.